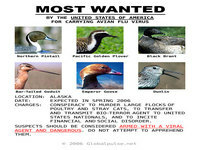 The U.S. government has launched massive surveillance efforts using not just spy satellites but also state and federal scientists to begin culling and testing key suspects for the potentially deadly avian flu virus. Federal scientists have conducted a study to analyze dozens of migratory birds and picked out a handful that would be useful to test the moment they cross into the United States, according to ABC News. The sampling will begin in April in the Izembek National Wildlife Refuge, in Cold Bay, Alaska. In recent weeks, scientists have expressed concern that bird flu may be arriving from the north rather than the south, like the Bahamas.